Twitter is an amazing tool that can really be overlooked by educators. When I think of Twitter I think about celebrities, horrible grammar, and now Donald Trump. I remember when it came out how trendy it was, but as I got older I felt like there was little or no reason for it. I had a Facebook, Instagram, and Snapchat to communicate with my family and friends so I just never felt drawn to Twitter...that was until last year. Last year is when I started my blog and I felt like I needed ways to promote my posts and just get my voice out there. I found very quickly there is such a large community on Twitter. As a teacher blogger, I created an account to follow all the different communities, teaching resources, educators and education authors to learn from. I found out so much just by following others and reading their posts on different subjects. By way of Twitter, I stumbled upon education chats, Voxer groups, and communities I didn't know existed. There is a whole world of educators, administrators, and tech gurus just out in full force discussing ideas and issues. It's a whole world at our fingertips if we just take to leap. I had a discussion at WITcon17 about the power of Twitter and why there is pushback from teachers. I think the truth is that the teachers who don't choose to use it, just do not understand it. They haven't used social media or Twitter in general and there is a fear of it being just "one more thing". When you look at it that way you are not recognizing the value it can truly have in the classroom and your teaching. Like I stated before there is a whole world out there through Twitter, a not so secret world of teachers sharing ideas, experiences, and support. Who wouldn't want to be a part of that? I have learned more from Twitter and the amazing people I follow on there than in any staff development. It is also nice to be able to truly personalize the PD to things I am interested and want to implement. Beyond finding resources and ideas you meet so many people. There are so many people who you can connect to from different states or countries. It will open your eyes in so many ways and allow you to vent, share, and learn from one another. When I started my professional twitter and my blog I put myself out there to this amazing world. I opened myself up to growing my PLN (Professional Learning Network) unsure of what might happen. What if no one liked my ideas? What if no one cared? What is no one accepted me? What if I do not have anything to say? What if I do not have anyone who I connect to? What if? Well, all those "What ifs" went out the window once I got started. I had the luxury of not having to worry at all. In this world of Twitter, there are so many lovely, kind, caring teachers that took me in and even championed my thoughts. I realize that in this profession life can be difficult, and we drive ourselves crazy over helping our students. We need to support one another. The communities that I have found on Twitter provide that support and give so many great ideas! Another benefit to social media is the ability to change the narrative. I have the luxury of working with an amazing staff and help growing students learn more than they could ever imagine every year. Sounds great right? Well sadly in the community I live in the school I work at is considered to be one of the roughest/ lowest in the district. Twitter, Facebook, and Class Dojo have allowed me to work to change that narrative. I get to show the amazing school I see and allow the community to get a better view of what truly takes place day in and day out. I get to show the am awesome events and celebrate students all across our school. Thereby changing the view of us. People fear what they don't know and make decisions off rumors and assumptions. So why not give them the information they desire and share with them what really makes your school special? 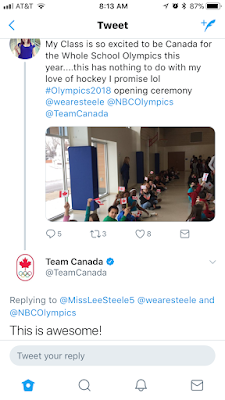 Team Canada tweeted us back during our school-wide Olympics. I have made my own Twitter page and used that to share all the different events and lessons that go on through my classroom and school. What I love is how much schools in my area are jumping on this idea and creating their own classroom pages and school pages. It is great to see teachers supporting teachers and retweeting other activities going on in the district. Schools have hashtags and students creating pages so they can follow their teachers. I even look through posts from the Jr Highs in order to retweet pictures with the hashtag #C2Alums, just to show my past students I still support them in their learning. We are creating our own community and allowing students to help write our stories. I know of teachers who have the classroom job of PR (Public Relations) and are the ones to take pictures, tweet out, and share the important things going on in class with the world. My class has recently studied the Winter Olympics. We represented Team Canada in our school Olympics so we decided to tweet to the real Team Canada. They actually tweeted us back!!!! When I showed my class they freaked out. They couldn't believe that they had the power of connecting with celebrities. After that, students asked to tweet out anyone we learned about with questions or comments. We didn't always get a response but if you don't try you will never know. This also opens up the possibility of taking the material we learn about in the classroom and connecting it to the world around us. So what do you or your school do to put your story out there? How do you share or change the narrative? Let me know!